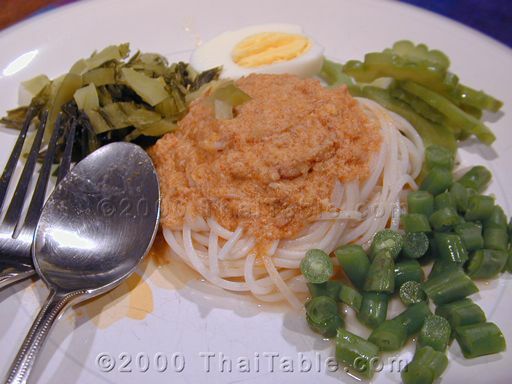 Noodles with fish curry sauce or kanom jeen nam ya is a dish of many flavors. This dish can taste totally different depending on the variety of the accompanying vegetables. 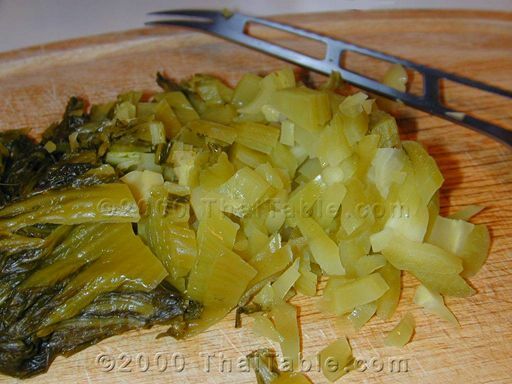 The vegetables can be served fresh or boiled. Recycle your baked, broiled or steamed fish into this dish. If you are avoiding red meats, this is a wonderful dish with lots of vegetables. If somebody says to you that don't have 'namya' (fish curry sauce), it means that you don't have the guts to do a difficult task! Kanom jeen namya is not as complicated as it might look. The only fuss that I can see is finding and putting together the vegetables, but it is worthwhile. 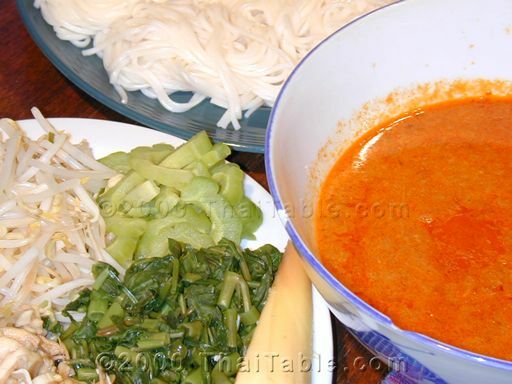 There are 3 parts to this dish, the noodles, the fish curry sauce and the vegetables. 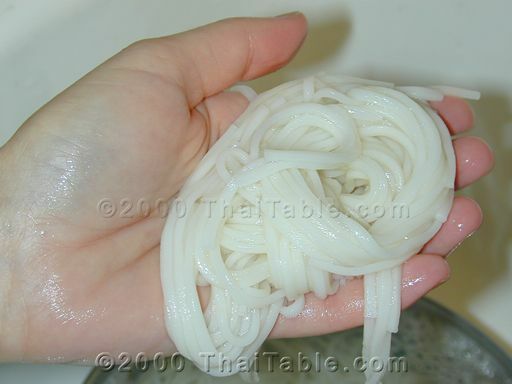 The noodles can be eaten with chicken curry as well. 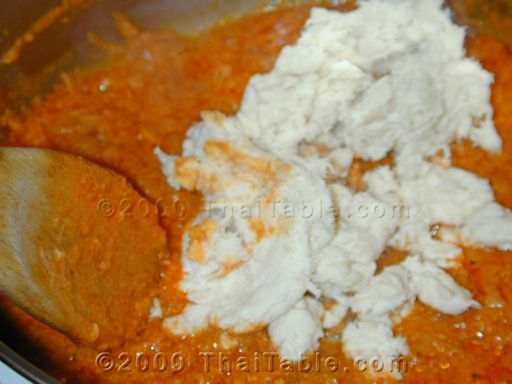 In Thailand, mud fish (aka snake head fish) is used, but any white fish, or even canned tuna is perfect. If you have left over fish that is not fried or heavily spiced, that will do, too. If you use fresh fish, cook it first by boiling or broiling. All you need is a small piece of filet 3 in. by 3 in. 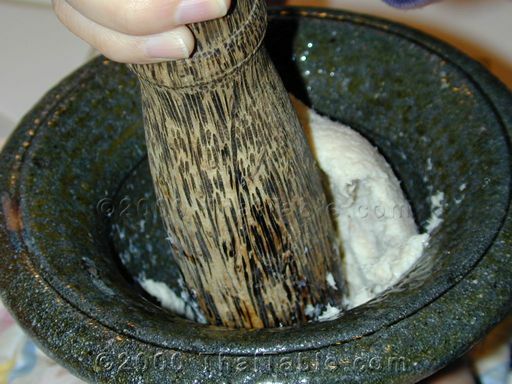 Mash the cooked fish in mortar or food processor to turn it into fine fibers. Ground the Chinese keys if you choose to use them. 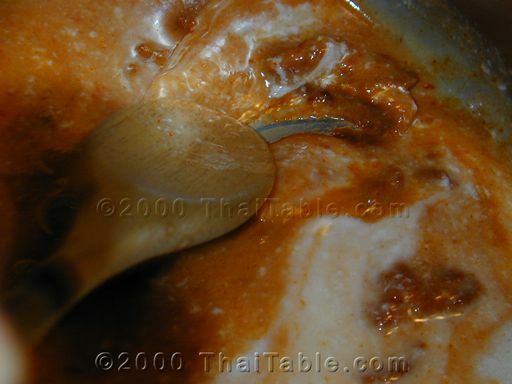 Most namya curry pastes available are sufficient without adding Chinese keys. But my taste buds require more. 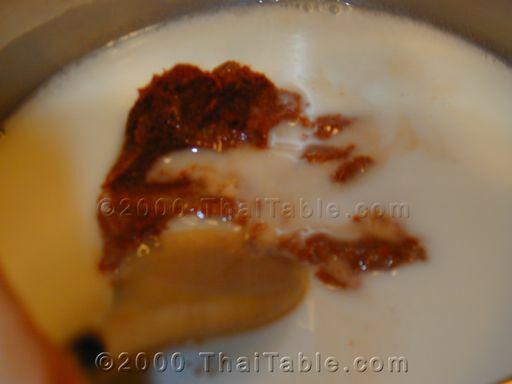 If you have a tough time finding namya curry paste, use red curry paste and add chinese keys. 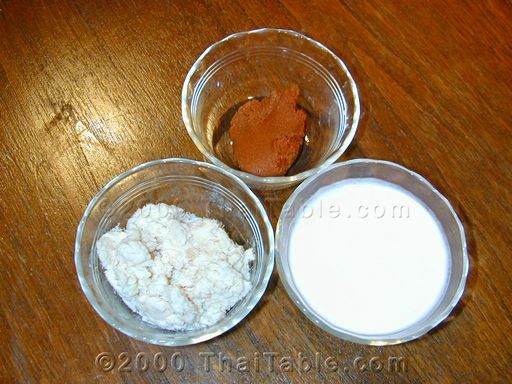 The difference between red curry paste and namya curry paste is that namya curry paste has an additional ingredient, Chinese keys. 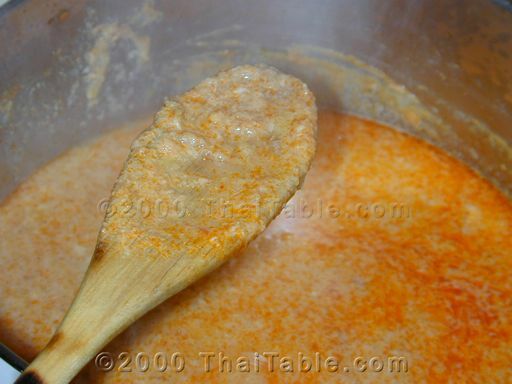 Add 1/2 cup of coconut milk and curry paste to a pot over medium to low heat. 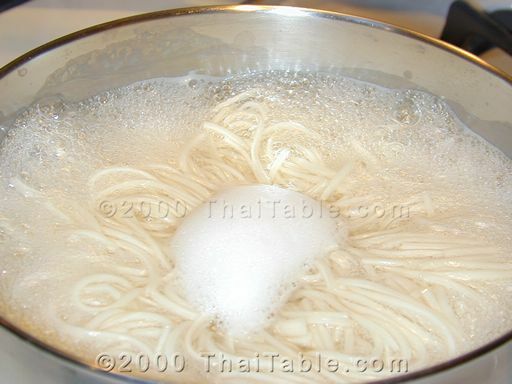 Let the mixture simmer until red oil starts to appear. Add the rest of coconut milk, fish, fish sauce and Chinese keys. It should have a thick consistency. This may sounds like a lot of vegetables. You don't have to have all of them. Pick and choose the vegetables that are available to you or that you like. My favourites are pickled mustard, banana flower and lemon basil. 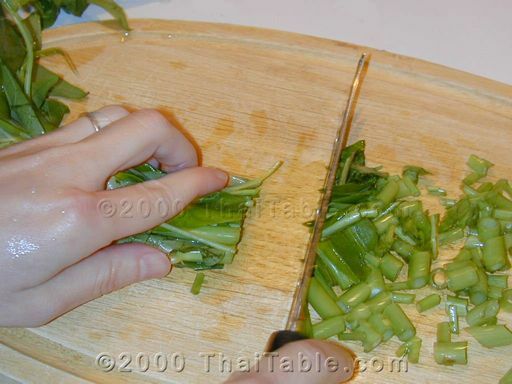 For green beans, Chinese water spinach and bitter melon, slice and blanch them. Set them on a serving dish. 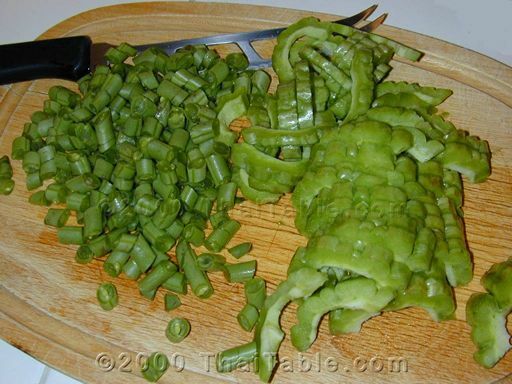 For pickle mustard, just rinse and slice. It is ready to serve. 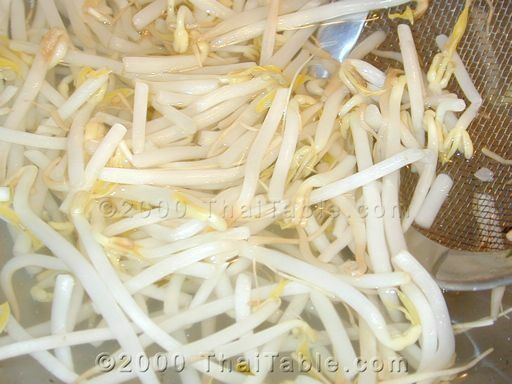 For bean sprouts, just blach and serve. 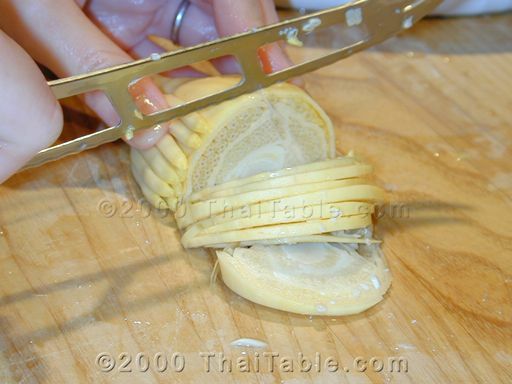 For banana flower, slice across the section. Soak the sliced banana flower in water with lime or lemon juice immediately until you are ready to serve to prevent oxidation that will turn them black. Drain add to the vegetable dish. Lemon basil are served with stems. The dinners can pick the leaves and drop them on their plates at the meal.